Explore the majestic attractions in Cairo through a day trip to Cairo from Hurghada by car, joined by a private Egyptologist tour guide to discover the history of Ancient Egyptian Pharaohs in one of the Seven Wonders of the World “Giza Pyramids“, then move to explore the treasures of the famous “King Tutankhamun” and other ancient Egyptian artifacts in the Egyptian Museum, finally return back to your hotel in Hurghada. Book Now! Transfer from Hurghada to Cairo & back by a private vehicle. Private Egyptologist tour guide through your trip. Shopping tour during your trip. The complex includes three majestic Pyramids belongs to “Khufu, Khafre, and Menkaure”. There are other six small pyramids, the mythical Sphinx, and the adorable Valley Temple that is associated with the mummification process of the ancient Egyptian Pharaohs. The complex dates back to the 4th dynasty. The Great Pyramid belongs to “King Khufu“. It is the oldest and largest of the three pyramids of Giza plateau and the only one to remain intact from the 7 Wonders of the Ancient World. The height of the great pyramid is 147m, the number of stones used in construction is 2,300,000 and it took twenty years to be built. The Great Sphinx was built by “King Chephren“. It is the largest statue in the world, standing 73 m. long, 19 m. wide, and 20 m in height. It is the oldest known monumental sculpture, the purpose of building this massive for protecting the complex from the enemy, this was their beliefs. Finally, we will transfer you back to your hotel to end your day trip to Cairo from Hurghada by car. Mohamed Elshemei and our driver Mahmoud for a great day. I was collected on time to the minute from my hotel even at 4am and driven carefully to the airport. The driver was friendly and couldn’t of done more even offering to look after some of the things like drinks I couldn’t take on the plane. The flight was great and on landing I was greeted my Mohamed outside the airport. The driver was also there and the day started immediately without delay. I’ve been to Cairo before and felt very safe with the guide and driver. The guide was very knowledgeable and despite Cairo traffic and parking being crazy, whenever we had to stop or park, Mahmoud seemed to always know somewhere and appear at the exact time and place without any delay so I was never hanging around. All tickets were bought for me quickly so I didn’t have to queue and the best thing about having a guide was NO HASSLE. Usually you get pounced on a bit by sellers which is all part and parcel of Egypt of course and you just accept it, but having a guide was great as I was totally left alone entirely which was refreshing. Would have no problems going anywhere in Egypt with these guys and would recommend anyone use them if you want to visit anywhere in the area. I’ve been to Egypt around 10 or 11 times and I now know that I will always use a guide. The day runs so much smoother, no hassle, no stress and unlike UK tour operators through the hotels, it’s completely private one on one service so no other hotel pick ups and drop off which often make the day much longer. I also like the fact the one on one service means no big groups and marked mini buses making you stand out like a sore thumb either plus you have the autonomy to tweak your day as you’d like rather than a strict time table. If you want to spend longer on one place just ask, don’t want to go to something no problem. You can just blend in and enjoy your day in your own time. Well done Guys – I’ll be back. My boyfriend and I were picked up by the best driver ever Muhamud. He drove us fast and sagely from Hurghada to Cairo in 4.30hrs. The trip was then guided by Emy, who’s most lovely and knowledgable. We went to the pyramids in the morning, Emy helped taking lots of photos. Then we went to the Sphinx, lunch, Egyptian Museum. Back at Hurghada by 21:30. Would recommend this trip to anyone. And my biggest thanks to Emy and Muhamud! Brilliant day out long day but well worth it private guide Ahmed Zakaria met us in Cairo to take us to pyramids and museum excellent guide very knowledgable allowed us plenty of time for photos etc made the long day worthwhile you won’t be disappointed if Ahmed is your guide. Great trip – would recommend. The day was well organised to fit everything in. Mohammed was a great guide and really made sure we enjoyed the trip and tailored it to what we wanted. He also did a great job at making sure we weren’t bothered by locals trying to sell stuff. He is very knowledgeable as well and a great guy. My friends and I had a great and safe time on this tour. We were visiting Hurghada for 2 weeks and decided the plane option was great since driving to Cairo seemed like a bumpy (but fun) nightmare on the other reviews. Our tour guide Mohamed Elshemei kept it real, telling us the history of the locations we visited and informed us of all the scams we’d run into. He was friendly and charismatic so it made the experience very easy going. The places we visited included a local breakfast spot (amazing), the Egyptian Museum, the Pyramids of Giza (all three), the pyramids of Giza, the great bizarre, Papyrus painting store, and perfume/essence store. The only thing I’d be aware of is because the bizarre and stores sell authentic items, you’ll be paying regular american prices. That was only thing we werent prepared for. Also, most things are included but their are optional excusions within the included tickets such as seeing the mummy room for an extra 150 EP or going inside the smaller pyramid for 60 EP more. During the tourist stops, we got a lot of historical info, got to go inside one of the pyramids, and had the option to ride a camel (we skipped it cause we were exhasted from the heat). Our tour guide was great at giving us the best photo ops so of youre into that, then your instagram will be ‘poppin’. The tour also included breakfast and lunch which were amazing Egyptian meals. If you like flavor, theyll give it to you. All in all, id definitely do it again. I feel like my friends and I wouldve been lost and robbed without an official and certified tour guide thats also a local. If youre visiting Egypt at all, stop by here. I bought this ticket before we arrive to Hurghada by talking Ahmad on Whatsapp. We had a good deal for 6 people and a private car took us from our hotel in Hurghada and take us to Cairo. We met our guide Muhammad there and we made a Historical Museum tour together. We learned a lot of things about Ancient Egypt and we saw the mummies. Then we eat lunch and went to Pyramids and Sfenks. After that they brought us back to our hotel in Hurghada. This is a once in a lifetime experience that you should try in your life and we’re glad we made it with experienced people. We totally recommend it. It was absolutely great. The driver picked us up at the hotel in Hurghada and surprisingly wasnt even late. By some people in my family he drove too fast but really, thanks to his a bit crazy driving the long way seemed much shorter. Our guide Amany, she was incredible. Really fun and chatty. Had so much knowledge about everything, had great tips and improvements on our tour, like take a boat over Nile to reach our restaurant, which was much nicer way to see Cairo than sitting in very chaotic traffic jam. And she is really good in taking funny photos with piramides. Overall, i was really happy with all the tour, the guide, the driver. My family were satisfied as well. So i would totally recommend them to anyone who asks. Kindly Thank for our guides Amina and Nadar ! 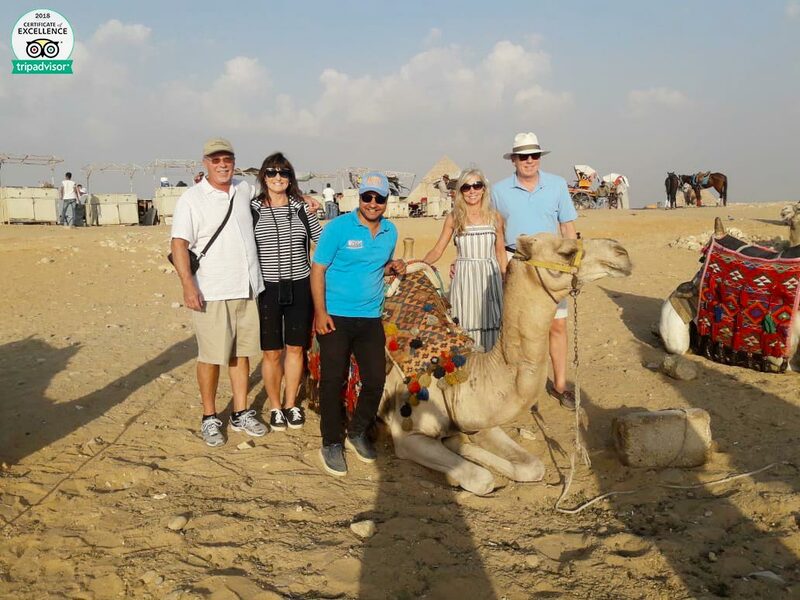 Tour was very well organized, our private guide was very friendly and flexible – there were no problems making changes to the itinerary of our tour. Saqqara, Giza, and Egyptian museum were all very much worth visiting. People were everywhere firendly, were it at the market or on streets. City seemed safe, just could be somewhat cleaner. Great trip. Tour guide ibrahim was friendly and knowledgeable. Really enjoyed our action packed day. Went to museum, then to the pyramids followed off by a cruise on the nile. My husband and I did the day tour with Nader as our driver and Ibrahim as our guide. We had a wonderful tour with so many sites. We both found Ibrahim very knowledgeable and accommodating. He knew everything and answered all of our questions with authority and patience. I would highly recommend this tour if you want to leave the resort for a day and get some of the Egyptian culture. Ibrahim even stopped and accommodated my need for an authentic Egyptian falafel. Nothing was forced or pressured and Ibrahim gave us options including a cruise on the Nile. The tour starts early in the morning and you are back at the resort by 9 in the evening. We booked a day trip from Hurghada to see Cairo and the pyramids. It was incredible from start to finish. It was a long day…. but completely worth it. We took our 3 kids (ages, 6, 4 and 2). They were able to handle the trip and we all enjoyed it. I do wish we had spent less time at the Egyptian museum and more time at the Pyramids. It would have been nice to have another hour at the Pyramids. Our private tour guide was great (Abraham). He was very nice and very helpful in every way. This tour company is very well organized. They are very responsive over email and helped us with everything we needed. I highly recommend using them for your day trip needs. Just got back from a fantastic holiday in Egypt. My trip to Cairo with Egypt Tour Portals was the best decision ever. I had exchanged several emails with Ahmad Sameer who had organised a great trip for us. We were picked up from our resort at 5.15 am in an air conditioned van by a gentleman who drove us to Hurghada airport. On arrival we were picked up by HALEMO he was kind, friendly with an amazing knowledge of Egyptology. His warm welcome made us feel at home. I had 3 son’s with me on the trip and HALEMO communicated well with the boys. I was surprised at how indulged the boys were in his talk. Me and the boys bonded with him really well. We went to the Egyptian museum and then had lunch at the river Nile with breath taking view. Then we visited papyrus and perfume factories. Where HALEMO gifted me decorative perfume bottles. I was touched by the hospitality and respect he showed me. Then we went to Giza pyramids Halemo talked us through and gave us all the information that we needed to know.The boys had a complimentry camel ride which they truely enjoyed. We visited the Khan el-khalili bazaar and Halemo offered us tea. It had a lively atmosphere which I really enjoyed. Then we had dinner on the way to the airport. Ahmed Sameer inquired about the trip which was definately outstanding. It was saddening moment for me and the boys to say goodbye as we bonded really well with Halemo. 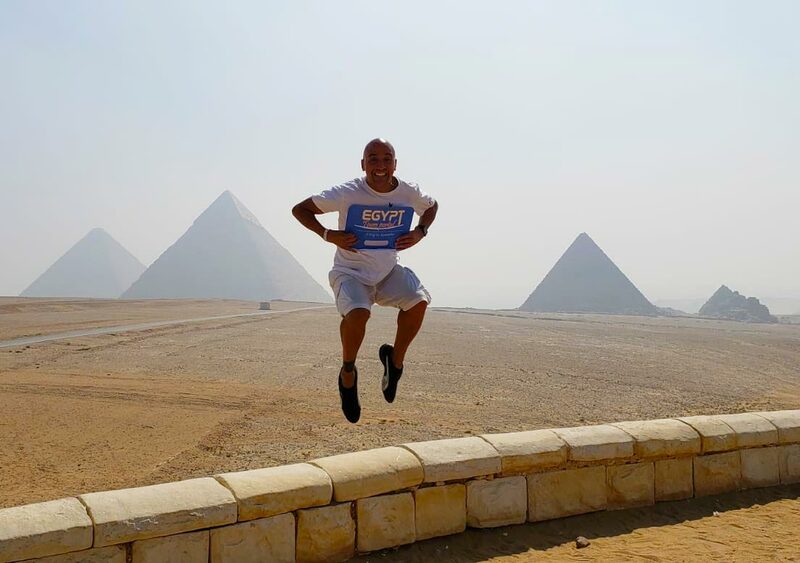 Egypt Tour Portal has provided us with an exceptional service; thankyou Ahmed Sameer. We had an amazing time with Halemo he is a brilliant guide. We also visited a perfume and papyrus shop before heading back to the airport for our flit back to Hurghada. Ahmed called us on the way back to make sure we were happy with everything which of course we were! 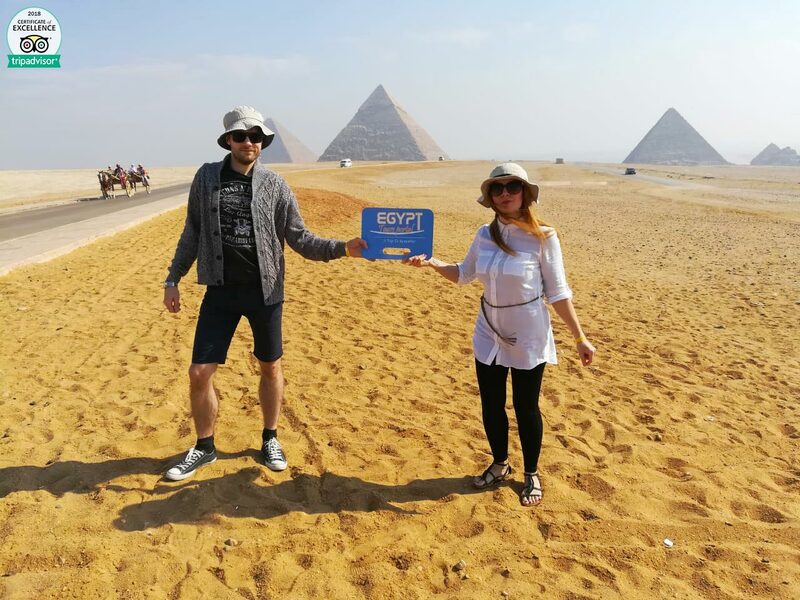 We had the best day ever and I would recommend Egypt Tours Portal to everyone.